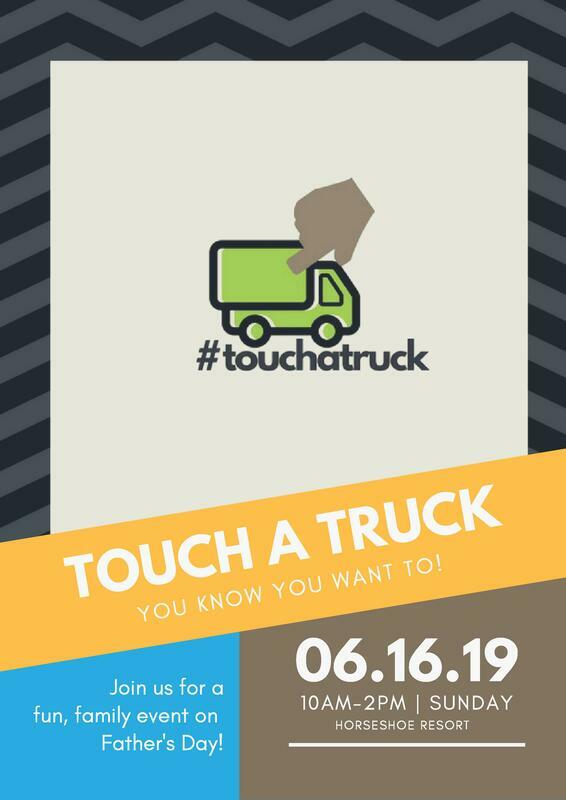 Touch a Truck Father's Day family event! in partnership with Horseshoe Resort! Advertising: done through all Chamber advertising and social media outlets, all Horseshoe Resort social media outlets plus on their electronic road sign, on The Dock Radio station and by event participants. Packages: We are working with Horseshoe to create a package (or two) for attendees. For example, we will have package that includes both entrance to Touch a Truck and Slope side activities Horseshoe for families of 4. (Slope side activities include: Chair life rides,lawn games, mini putt, hiking trails, an inflatables course, plus more). Details: Event Tickets will be sold in advance at an early bird rate, as well as at the door. Attendees who purchase packages will receive a wristband to enter Horseshoe events. This will be a fun, family day for everyone and a great gift for Dad! We have created sponsorship and participation opportunities for our local businesses to be involved in this event! We hope that you will consider participating in this event this year. This event will be a highlight for the kids, as many do not get the opportunity to see these types of vehicles and machines up close! To reserve your spot, please contact the Chamber office at info@OroMedonteCC.com or call 705-487-7337.